Get one or more Pocket Operators with some crucial accessories, for one packaged price. Making music has never been this fun, or mobile. Pocket operators are cleverly designed on a single circuit board. By placing all vital and sensitive components under the LCD display there's no need for an outer case, which saves costs and leaves room for high quality components to guarantee the best possible sound and very low power consumption. The space under the display also doubles as a speaker box. 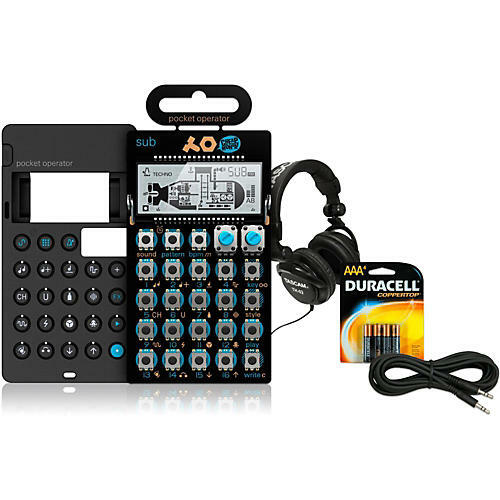 This bundle includes the PO14 Sub Pocket Operator with a custom case, a pair of Tascam TH-02 studio headphones, AAA batteries, and cable.